From my acquaintance with the oeuvre of the sculptor Orna Ben-Ami, and as I write this brief introduction to her work, I have but one regret, that I could not follow the evolution of her research from her beginnings as an artist up to the present day. It is widely acknowledged that sculpture has had its ups and downs in the modern era. Since the end of World War II it has suffered a precipitous decline due to the abandonment of sculpture as celebratory and ornamental art, contrary to the important position it had always held as a synthetic element in urban planning and architecture. Relinquishing their worldly role, sculptors preferred to retreat into a series of differentiated narrative modes which we, the viewers, do not always understand, though perhaps only in an anti-rhetorical sense more analogous to our taste. Moving away from the celebratory was not an easy task and Orna Ben-Ami has proven herself a leading figure of this revolution. Her sculpture offers an original demonstration of how one might conceive of sculpture without contextualizing it—as often happens in the modern era, with monuments to war heroes, or to those who died tragic deaths—in a heroic or funerary context. Rather, Orna Ben-Ami’s work seems to revolve around Martini’s great question of how to shape a pomo di mela (apple core) without its sculptural or narrative value being diminished in comparison to painting. It is not by chance that one of her works features just that: a fruit, a pomegranate, with a grenade fuse attached to it, a representation of the themes of war and peace, themes that retain their ironic as well as tragic value, and above all, are not lost in rhetoric. We do not miss painting here. Thus, Orna Ben-Ami is one of those fortunate cases where one can write with a sigh of relief about art, while also maintaining a balance between criticism and art, as her art without doubt carries meaning for the reader, first and foremost, for the above mentioned reasons, but also for the geniality and irony that bursts forth from her works, and the contrast between material and subject that quite surprises us. It is indeed startling when a canvas made of iron tears because it is balanced improperly on an easel or when a belt or garment hangs fluttering from a slightly crumpled wall or a ballet slipper poises on an iron beam and bends it. The ideas, simple as they are, are expressed in a hard and unyielding material generally intended for other uses (think of iron beams used in construction), and in such a way that no undue attention is called to the implicit incongruity. After all, the purpose of art is to stun, to hide the artistry (Horace), to demonstrate the un-demonstrable, the unreal, until it all becomes fantastically true (like Alice in Wonderland). Art must be hope! It must give man or woman the possibility to exist beyond their crude reality and surpass their limitations. Irony triggers the miracle of opening our consciousness to liberating laughter, relaxes the tension of consciousness, of rationality and theoretic composition. Irony is surprise, astonishment, disorientation. Irony is a fundamental requisite if we are to move beyond the suffering that is life. Irony is an intellectual expression, which Orna Ben-Ami conveys in her unique and original work; sculpture’s traditional characteristics are now in disarray, disoriented. Her research lies outside of historic abstraction, but remains close to us in time and sensibility. The work of Orna Ben-Ami cannot be classified within the rigid framework of history and art history, because she is not a lover of convention or tradition. In a certain way, her work reminds us of the paintings of Domenico Gnoli with their enlarged, amplified parts rendered macroscopically more real than real and that surprise the world with their abstract truths. 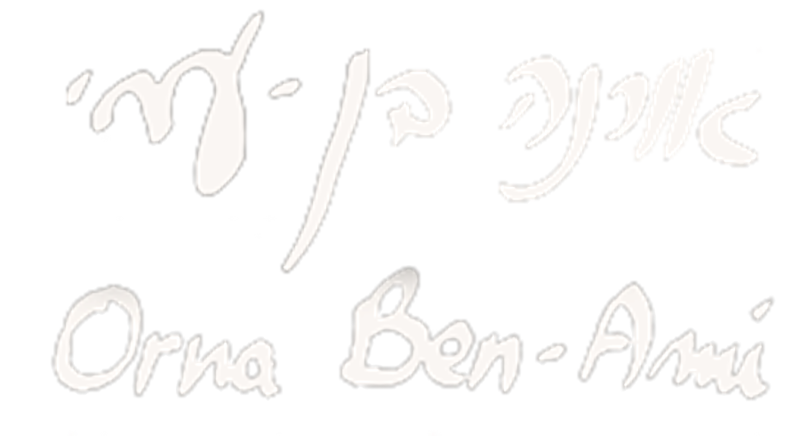 It is no coincidence that writing about Orna Ben-Ami’s work one cites a painter, for in these works, the most important thing is the color, even though it is simply one color: brownish and rusted like that of iron left outside and polished with emery and sandpaper. It is a color obtained without any prettification, but simply with the tangible spirit of one who seeks to show just how important it is to construct, without any other purpose than that of rendering useful the apparently useless simplicity of normality, a game that enables one to live. Allessandro Masi is an art historian and the secretary general of the Società Dante Alighieri in Rome. This essay was written for the catalogue that accompanied Orna Ben-Ami’s 2003 solo exhibition at Café Europe Centro di Arte Contemporanea associazione culturale, Roma. All rights reserved to LightenUp.